An important but often overlooked characteristic of the tax code is whether or not it is indexed for inflation. Inflation indexing means that tax brackets (and other important dollar-amount features of the individual income tax, like standard deductions or personal exemptions) are revised annually to reflect price increases that result from inflation. Higher income can bump a taxpayer into the next tax bracket, even if that higher income is merely keeping pace with inflation…A lack of inflation adjustment can also push more of a taxpayer’s income into the highest bracket for which they qualify. This combined with bracket creep can lead to a higher average tax rate. This is problematic because increased incomes haven’t risen in real terms—only nominally. Indexing addresses this by altering each bracket level each year by the level of annual inflation. Take an individual who earns $40,000. Currently, that person takes a standard deduction of $6,100 and a personal exemption of $3,900, leaving $30,000 as taxable income. After applying the tax table, he would owe $1,744 in state income tax. If the taxpayer then gets a 2 percent raise to keep up with inflation, his income rises to $40,800. Under existing state law, the tax brackets also adjusts with inflation and his state income tax bill will rise only to $1,779 (a 2 percent increase)… [Without inflation indexing], the taxpayer’s state income tax would rise to $1,808 (a 3.6 percent increase). Only 12 states fully index brackets to inflation (note that New York's indexing is temporary). California and Oregon partially index their brackets. 19 states (plus D.C.) with multiple brackets do not index at all. Check out the map below to see where your state lands. 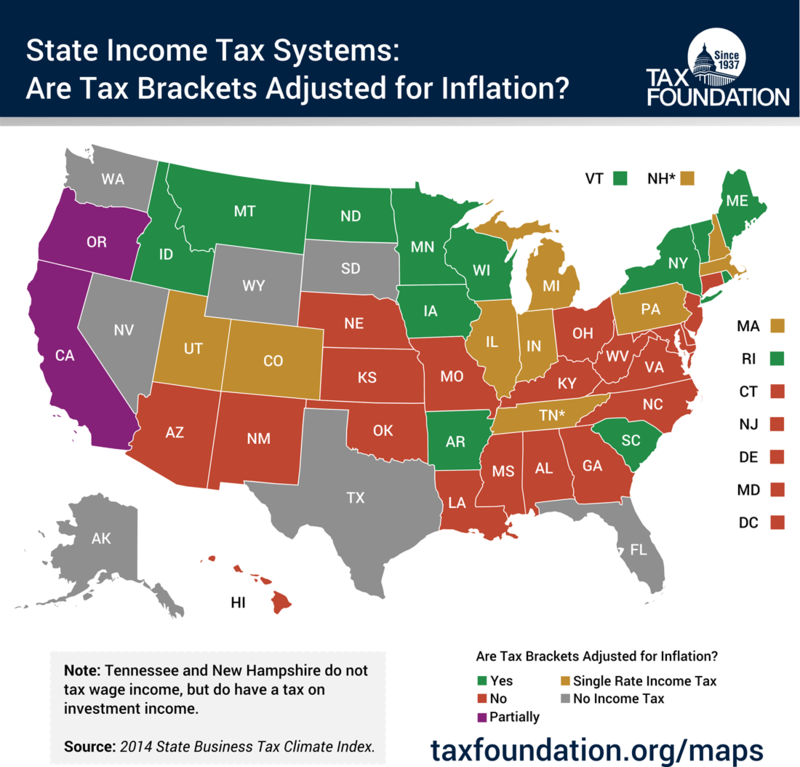 To see which states index their standard deductions and personal exemptions, see this page of our 2014 State Business Tax Climate Index. See last year’s version of this map here.